Why is the average age of a developer so much less than the average age of a professional worker in the United States? Is it because the industry as a whole is striving to keep people out? Are companies replacing people as soon as their salary starts to get higher with people who make half as much and will work twice as many hours for the same salary? Check out what I think about it in this week’s episode. This post is about a handy little function that works across many database systems, including Sql Server, Oracle, and MySql. I often forget about it and at times even end up coding some workaround that would have been a lot easier if I had just used NullIf(). NullIf takes two parameters. The first parameter is the value to check and the second parameter is the value that should equate to NULL. Let’s take a look at an example to hopefully make this clearer. First, we will create a table to work from, populate it with some data, and select the results out so that we can see what we have visually. In this case, the Street Address column is nullable, but for Keith’s record the developer chose to insert a blank space instead of a NULL for a missing address. If we try to just write a query to get rid of the nulls, we still have the blank space issue. 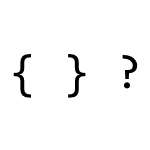 Here is a query that uses COALESCE to get rid of the NULLS and its results. That’s much more succinct and I feel like it conveys our intent much more easily. Here’s another practical use case for NULLIF(). Given the following table and values, we want to find the average sale on each given day. Now, we easily get our results. This helps identify which records are causing our issue and can now easily be dealt with. If we don’t like NULL in our results, we can use ISNULL() or COALESCE() to put a sensible default answer. Done and done. In episode 42, I don’t have the answer to Life, the Universe, and Everything, but I do have thoughts and reactions to Microsoft’s 2016 Build conference. I cover Bash on Windows, Ink, Bots, and Free Xamarin for everyone! This is going to be another one of those posts that will surely help some people, but it is far more likely to help me later 😉 I have culled these techniques from a variety of sources across the Internet, but I’m not entirely sure who taught me what in order to give proper credit. 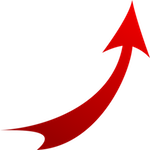 However, what if you wanted to easily see how each of those customers’ sales looked month over month in comparison to other customers? Typically, a data analyst might take a result set like that and use a tool like Microsoft Excel to create a pivot table. That would let your rows be per customer and your columns would be per month. Reporting wonks could also use a tool like SSRS to pivot the data for presentation to users. However, if you are using Sql Server 2005 or later, you could also use the PIVOT command. A few peculiar things to notice. First, the values that become the new columns are not quoted. They are treated like literals. I didn’t have to say ‘January’, ‘February’, etc. 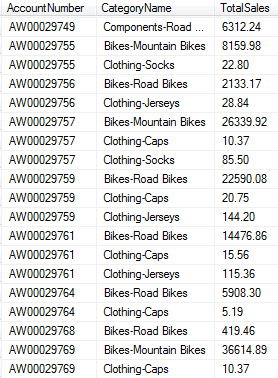 Secondly, notice that I had to name the pivot table (as pvt here). Even though I don’t reference it, if I omit it, the Sql statement won’t parse and execute. Look at the results below. Notice a third strange thing. Even though I selected out all of the columns (using SELECT *), it did not actually return all columns like you would normally see in a join situation. 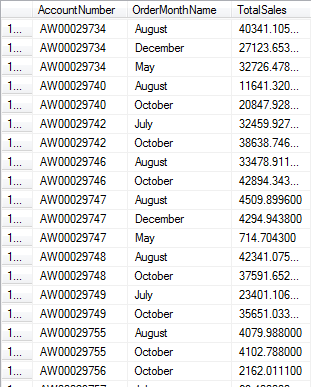 It showed the AccountNumber column from the SalesData CTE, but then it ignored the OrderMonthNames and TotalSales columns from SalesData. The PIVOT was smart enough to know that those values were being represented in other ways in our new dataset. If you want/need to get rid of the NULLS in the results, you can do it the same way that you would do it in a regular query. I could change the “SELECT *” to be “SELECT AccountNumber, ISNULL(January, 0.00) AS January, ISNULL(February, 0.00) AS February” and just continue that pattern for each month. Simple enough and that gets us pretty far along the way. But, what if I wanted to instead see customer sales by product category? I could see every product category that exists in the system right now and do a static pivot. However, everytime someone updated the system with a new product category, we would have to modify our query (potentially many queries across the enterprise). Is there a way to do that? However, we can use Dynamic Sql to dynamically determine our static columns, if that makes sense 😉 Let’s take a look at the query needed to just return the standard results, grouped by customer and product category. There are 8 unique category – subcategory combinations in these results, but it doesn’t take much imagination to see how new products can be added all the time. Probably several new subcategories a year. How can we handle that? The key is those columns listed out in the PIVOT operator definition. Let’s see how we can build that dynamically using a temp table to make working with the data easier. Hopefully you find this helpful (I’m sure future me will be back here). If you have any questions, let me know in the comments.